With summer now in full swing, many of us in Brooklyn are noticing how the seasons seem to have changed over the years and wonder if these variations are related to climate change. How can we already see climate change locally? What will this look like in the future? The National Oceanic and Atmospheric Administration estimates that there’s a 50 to 60 percent probability of temperatures above the normal range in our region for the remainder of July through September (an “even” chance would be 33 percent). We have already experienced one heat wave (June 11–13), defined as a consecutive stretch of at least three days with daily maximum temperatures of at least 90°F. And this week, we seem to be in the midst of a second one. Since around 1980, regional annual mean temperatures have increased by roughly 3°F , and natural ecosystems in New York State are responding in observable ways. Scientists are finding a growing number of invasive species such as the woolly adelgid, an aphid-like insect from Asia, which destroys hemlock trees. In many areas of the state, the first leaf date is more than eight days earlier than in the 1950s, and the first bloom date is more than four days earlier. 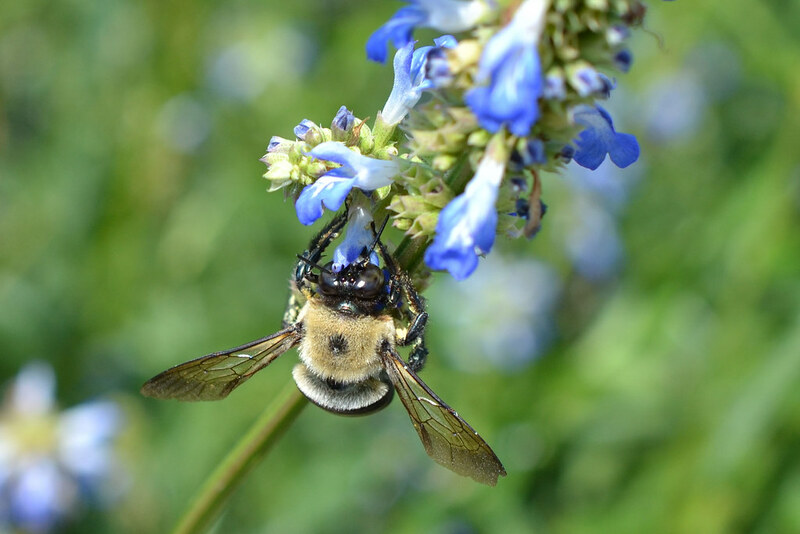 Pollinating bees in the region show up about ten days earlier than they did 140 years ago. New York State breeding bird and oceanic fish population ranges have also shifted northward over the past several decades. In general, warm-adapted species seem to be extending their ranges geographically, and some species are going extinct . The urban heat island effect can only exacerbate such changes in the city. Changing species distribution in our forests has numerous potentially detrimental impacts on ecosystem functioning, such as nutrient cycling and water quality. But it’s worth noting that nonnatives can sometimes be beneficial, and that the very definition of “invasive” can sometimes depend on how far back in time one defines the baseline. Changes at Brooklyn Botanic Garden mirror the observed responses to climate change in our region. A number of unusual, and in some cases unprecedented, observations have been made by staff: A lacebark pine tree was removed from the Conifer Collection after staff suspected the presence of southern pine beetle, a small insect pest native to the Southeast that has recently expanded its range to New York State. The larvae of the pine sawfly, a European pest, have also been spotted in pitch pines in the Native Flora Garden, a first for BBG. According to Garden staff, there are also more chipmunks than usual, and more typically southern birds, such as the Baltimore oriole, have been spotted. 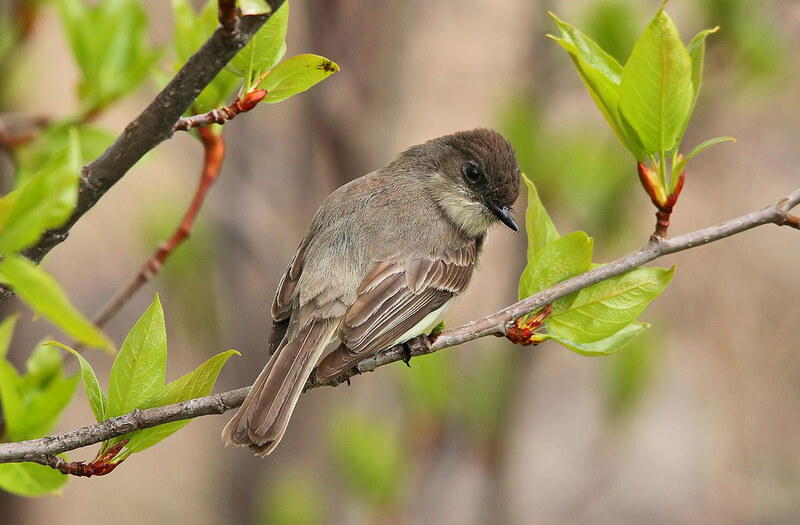 Other migratory birds, like the eastern phoebe, have been arriving earlier in the spring than in the past. Plants at BBG that are at the northern edge of their hardiness zone, such as crepe-myrtle and some water-lilies, are currently thriving, while those at the southern end, like mountain laurel and sugar maple, appear to be struggling. BBG gardeners say that these changes are affecting their plant palette (the choices they have for new plantings), and some are already choosing drought- and pest-tolerant plants. Gardeners have also reported that during heat waves there seems to be a point when no matter how much one waters the soil, the plants are listless and seem to have trouble taking up water. What can we expect for the future? The science behind climate change predictions for our region through the 21st century has been summarized by the New York City Panel on Climate Change, mirroring international efforts. A key element of these reports, often ignored in the media, is that each predicted change is accompanied by an estimated “level of confidence” and a probabilistic range. For example, in our region, the highest confidence level is attributed to predictions of temperature change. The 80 percent likelihood range of the mean annual temperature increase in our region is between approximately 4°F and 10°F by the 2080s. It is hard to grasp what this means in real terms, but the impacts may be more tangible when expressed in concrete form: Within 60 years or so, it is 80 percent likely that, locally, the number of days that reach at least 90°F will jump from 18 days per year to as many as 87 days. In essence, the number of heat waves will least double, and more likely triple or quadruple. Of course, the natural variability of the earth’s climate system means that there will be some less dramatic, and some more dramatic, years as the century progresses. The longer warm seasons accompanying a temperature rise of this magnitude could result in a proliferation of pests, possibly multiple generations per year. In both natural and highly managed ecosystems, temperature is the trigger for many (but not all) seasonal cycles, and the reactions of species in symbiotic and synchronized relationships (for example, plants and pollinators) may end up mismatched, resulting in the disruption of ecosystem functioning. How will we cope locally? Two possible goals to strive for are resilience and resistance. Resilience can be defined as the capacity to recover quickly from difficulties, and it requires both thought and vigilance. In contrast, resistance refers to the ability to remain unaffected by something, especially adversity. Resistance to the potential impacts of climatic variation on ecosystems would be nice, but it is unrealistic, and so we must strive for resilience. For small, heavily managed ecosystems such as BBG, resilience includes choosing more plants adapted to higher temperatures and frequent heat waves, increasing irrigation when needed, and using sustainable pest-control regimes. Larger, less-managed ecosystems are more difficult to control. For example, in my own work in collaboration with the New York City Department of Environmental Protection, our project to evaluate the potential impacts of climate change on the city’s water supply includes an effort to estimate how ecosystems surrounding our reservoirs might change, and how those changes might affect our ability to maintain water quality at our currently high standards. In future blogs we will discuss other seasonally relevant aspects of climate variations, their potential impacts on BBG, and how initiatives such as the Visitor Center’s green roof and rain gardens and the Water Garden contribute to the resilience of Brooklyn Botanic Garden and of the city as a whole. Forward this to climate change skeptics in Congress. Interesting context about the impacts. Professor Frei, I must admit that “climate change” articles sometimes make my eyes glaze over, but you really brought it home for me: that my human children and my plant “children” may see as many as 87 ninety-degree days a year! Thank you and looking forward to your future blogs. 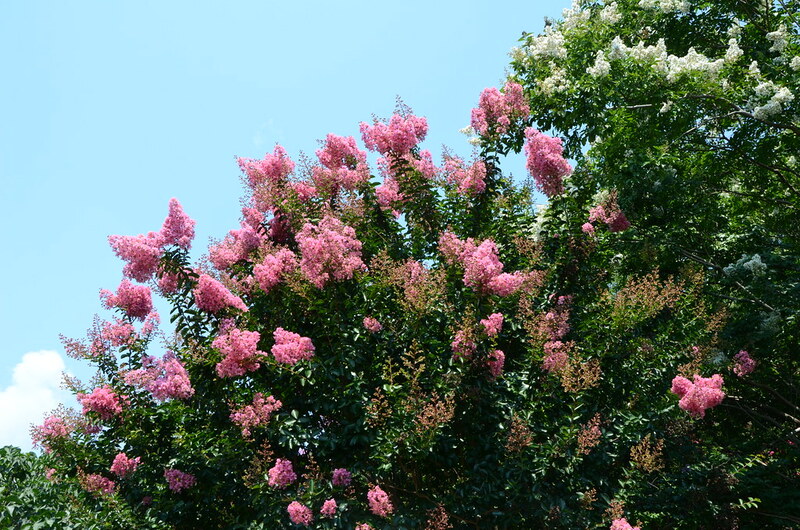 Lagerstroemia indica (crape-myrtle) near the Cranford Rose Garden. Photo by Jean-Marc Grambert. The eastern phoebe (Sayornis phoebe) is the new harbinger of spring. This flycatcher arrives in the New York area in mid-March when the weather warms and insects get more active. Photo by Cephas. 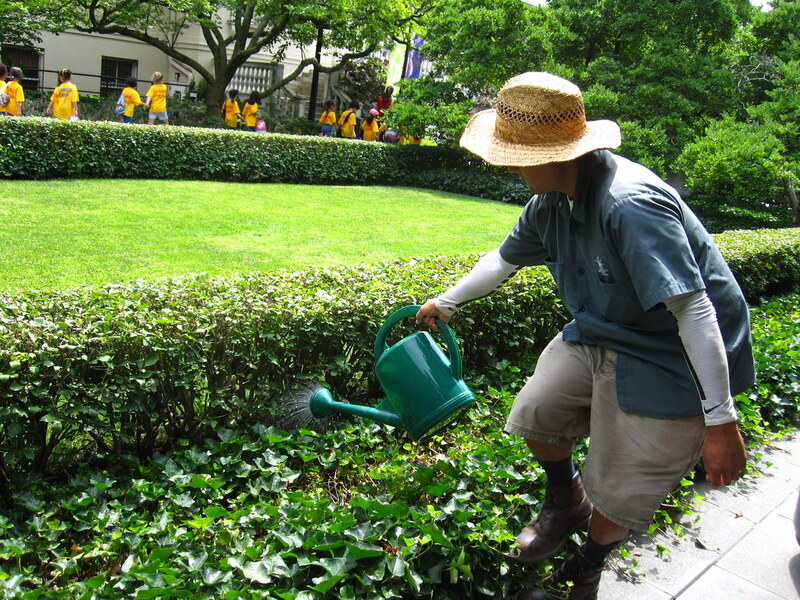 Wayken Shaw, Magnolia Plaza curator, applies a solution containing beneficial nematodes to the soil to combat pests. Photo by Sarah Schmidt. A bumble bee collects pollen among BBG's Rose Arc plantings. Photo by Elizabeth Peters.